Roger Federer was knocked out of the U.S. Open on Monday by unheralded John Millman of Australia, who stunned him to set up a quarter-final against Novak Djokovic. The 37-year-old Swiss had prioritized winning a sixth title at Flushing Meadows this year, but was far off the pace against the world No. 55. Millman fought back to win 3-6, 7-5, 7-6 (7), 7-6 (3) in three hours, 38 minutes. Now he meets Djokovic in his first Grand Slam quarter-final on Wednesday. 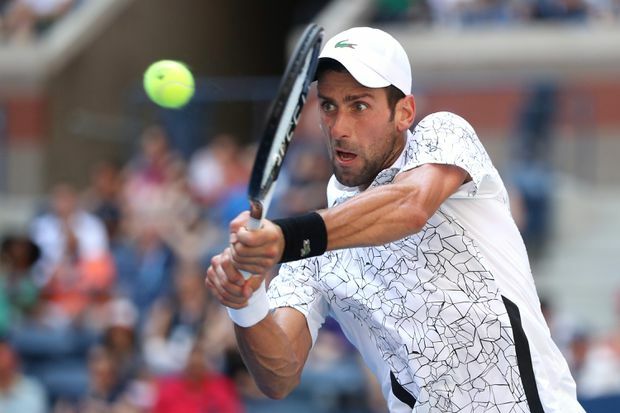 Djokovic beat Joao Sousa of Portugal 6-3, 6-4, 6-3 in blazing heat earlier Monday to move into the final eight at Flushing Meadows for the 11th time. Other winners, also advancing to the quarter-finals, were Kei Nishikori of Japan, Marin Cilic of Croatia and, on the women’s side, Madison Keys. Naomi Osaka and Carla Suarez Navarro, who ousted Maria Sharapova in an evening match. Novak Djokovic of Serbia advanced easily to the quarter-finals on Monday. Djokovic, the No. 6 seed, is the reigning Wimbledon champion. Djokovic left the court at Arthur Ashe Stadium for a medical timeout — the second time in the tournament he’s sought help from a doctor because of harsh weather. Nishikori easily outclassed Philipp Kohlschreiber 6-3, 6-2, 7-5 earlier on Monday. Nishikori later told reporters that the brutal conditions made it difficult to keep his head in the match. “It’s not easy with the heat. You know, I couldn’t think too much between the points. It’s not easy to focus [on] every point, you know. You lose some concentration,” he said. Kohlschreiber thought the heat – as well as Nishikori’s slick performance – made the match particularly challenging. Nishikori will next face seventh seed Cilic in a rematch of the 2014 final. Cilic showed no ill effects from his gruelling, late-night victory two nights ago as the Croatian beat David Goffin 7-6 (6), 6-2, 6-4. “I started a little bit slower and he was playing good in the beginning and when he was serving in the first set at 5-4 it was a crucial break for me to get back in the game,” said Cilic, who made just 46 per cent of his first serves. 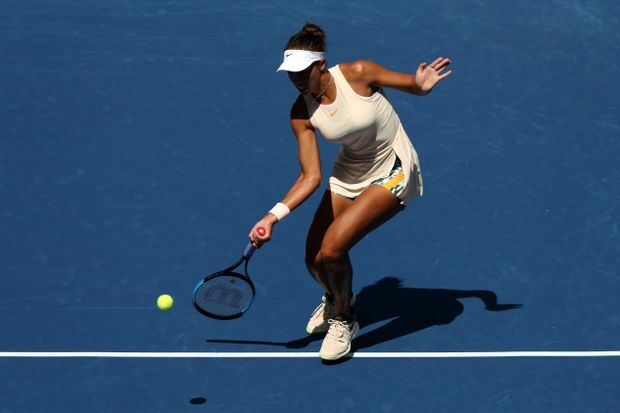 Madison Keys relied on both her dangerous serve and powerful groundstrokes to advance to the quarter-finals. On the women’s side, Keys eased into the quarter-finals with a 6-1, 6-3 victory over Slovakia’s Dominika Cibulkova. “The biggest thing is just being able to push her back off of the baseline where she likes to hold her ground and just be able to dictate points like that,” Keys told reporters. Keys has been a quiet presence for much of this tournament as public attention was focused on other stars. “It’s, you know, kind of nice to be under the radar,” Keys said. “Either way, I’m pretty used to it either way. This one just seems like it’s a little bit more low key. Keys took care of her business in 77 minutes Monday. She finished with a 6-0 edge in aces, and she broke Cibulkova’s serve five times while facing just one break point. Next up for Keys is a quarterfinal matchup with 30th-seeded Suarez Navarro of Spain, who ousted 22nd-ranked Sharapova of Russia 6-4, 6-3. While both players hit 15 winners, Sharapova was done in by committing 38 unforced errors. Suarez Navarro, whose 30th birthday was Monday, gave away just 20 points. The Spaniard said she expects a battle from Keys in the quarter-finals. Sharapova said she was too tentative. Earlier, Osaka became the first Japanese woman to reach the quarter-finals of a Grand Slam in 14 years, edging Aryna Sabalenka 6-3, 2-6, 6-4 in a matchup of 20-year-olds. Osaka said Sabalenka’s blistering serve had been a key challenge to overcome toward the end of the match. She next faces Lesia Tsurenko of Ukraine.